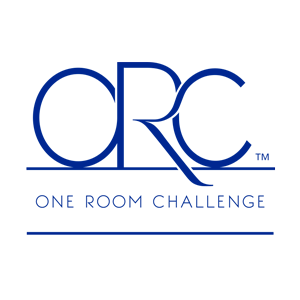 This is the fifth week of the One Room Challenge. Next week is the big reveal! 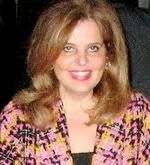 I recall that Linda of Calling It Home once referred to me as one of the most personally private bloggers on the blogosphere. Well, today I will reveal something about myself - I love to clean my house. I have never had a cleaning lady and have never even considered it. I love the entire process of taking care of my home. Those of you who balked at me saying that I enjoy doing laundry with my new washer and dryer probably just fainted. Part of my love for cleaning includes having wonderful cleaning tools. No plastic for me - all wood and leather and lambswool and goat hair and such. They are works of art really. 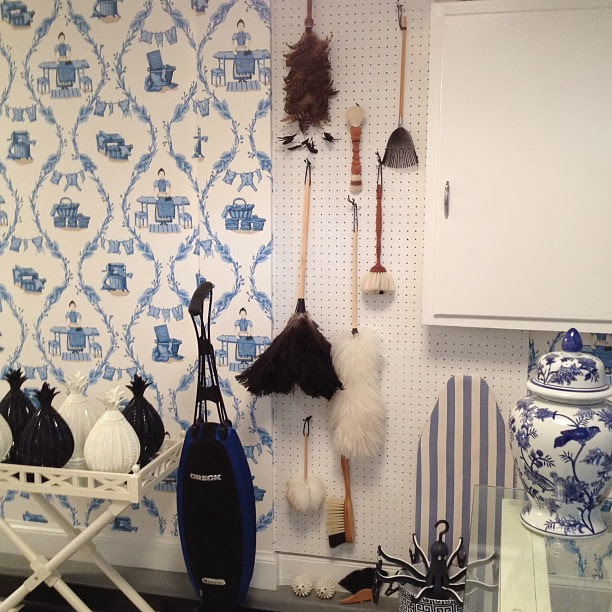 Check out these photos from one of my favorite stores - John Derian in NYC. These cleaning tools are made by a wonderful German company - Redecker and can be purchased online. Crate and Barrel has started a section in their stores and online called Clean Slate and they carry some of the Redecker line as shown just below. 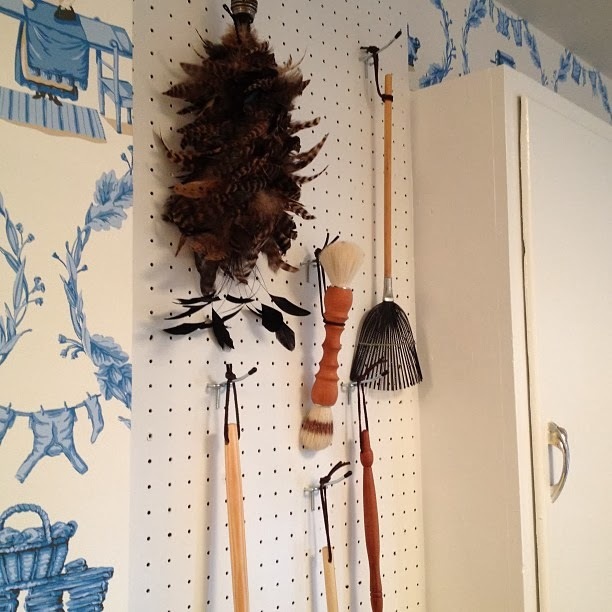 I wanted to create an area in my laundry room for my collection of cleaning tools. In my laundry room, there was already a large pegboard, so I just bought pegboard hooks at Lowe's. Now everything is easily found and is a beautiful display as well. I also did another DIY - now I bet Linda has just fainted. I wanted a chair in the laundry room for the mud room area I have created to sit and take on and off muddy wellies and wet boots. 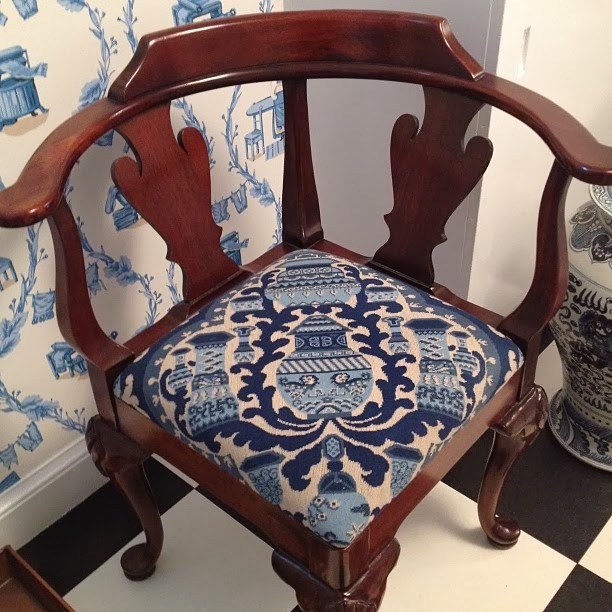 I had a mahogany corner chair in one of the bedrooms that was not really being used and decided it would be ideal. I found this gorgeous Clarence House Les Porcelaines Bleu designer sample on Etsy for $15.00 and used it to cover the seat. I placed the pattern on the diagonal and I think it looks perfect. My laundry room is quickly becoming one of my favorite rooms in the house. 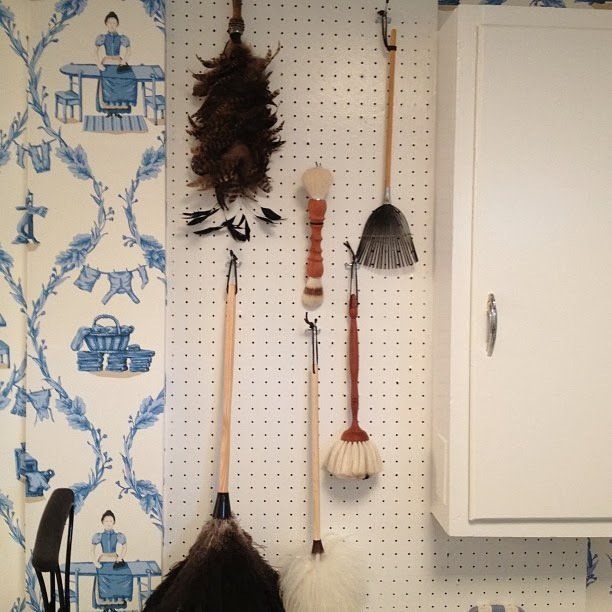 I am using things you don't normally find in laundry rooms - so far you have seen my Brunschwig & Fils wallpaper, a dupioni silk roman shade, an antique ginger jar, Clarence House fabric, a mahogany chair, and you won't believe what I have in store for the reveal next week. Everything I have shown you was found very inexpensively on eBay, Etsy, and consignment stores. My laundry room is not only functional, it is gorgeous. Rules were made to be broken in making your home your own. I hope to see you all next week for the reveal. I cannot wait to show you the rest. 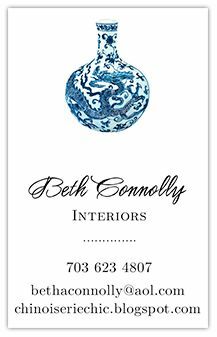 Thanks so much to my sponsors and friends of Chinoiserie Chic for supporting this One Room Challenge. I hope everybody else had made lots of progress in their rooms. Let's go see. 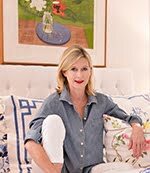 Chinoiserie Chic - that’s me! Beth....coming clean [ha ha] with your deep dark secret is a first. Not sure I have met too many people who are like you:) The laundry room is certainly come a long way and looks fab. It is gorgeous. I know it will be magazine worthy. Cannot wait! I had to pick myself up off the floor to type this. It just goes to show you that you never really know anyone. Your cleaning supplies are beautiful, and I would not have a clue about where and when to use each one. Maybe you could give a demonstration? I am really impressed with your chair. If this were my laundry room, it would double as a guest room....it's that lovely. What a perfect spot for your cleaning supplies. It looks great and is so organized. That chair!!! It's so pretty and I love that you're putting a mahogany chair with beautiful fabric in your laundry room. I absolutely CANNOT wait to see the photos next week!! Only you Beth, only you! I love doing laundry, and iron my sheets. However....I hate cleaning and cherish my cleaning lady. I still am dying over your wallpaper, but need smelling salts when I saw your chair. I don't know what set me over the edge. 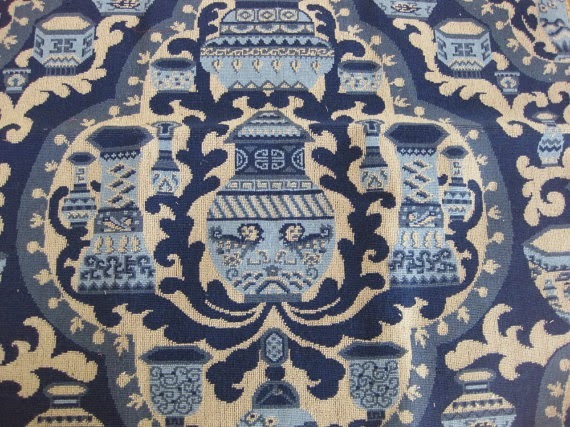 The fabric or the chair! I'm in awe every week, Beth!!! I had no idea there were such beautiful cleaning supplies ~ my plastic yellow broom and dust pan are looking really tacky right now! Can't wait to see more of this! I love this reveal of yourself. Not surprised that you would be drawn to beautiful tools and have the need/obsession? for them to be beautifully displayed. From the beginning I thought this room would end up being a sister to your "closet". Not too far wrong!!! Your room is my very favorite one of the the entire lineup. Way to go. Thank you for the inspiration. I have been working toward my goal of enjoying cleaning. Your post really nudged me a big step further. The entire room is superb. Love the chair and the fabric. Looking forward to the reveal. I am so excited for your reveal! I love where you are taking this room. And thanks for the fine cleaning implement introduction. My father is a fanatic and would love these! I think you put us all to shame with those cleaning supplies! Great idea and I love the chair! I love your attitude about cleaning your own home. Lately, I switched my housekeeper to biweekly visits, because I don't like the intrusion on our sanctuary, and I enjoy keeping everything neat and tidy. In fact, when the housekeeper leaves, I have to straighten every picture, readjust every foo dog and nick nack, move area rugs, etc., because she doesn't have a feel for how things are placed. I have thought of doing the cleaning myself, but, until now, have rejected it. Reading what you have to say about enjoying the process struck a responsive chord with me. Your home is filled with treasures, and caring for them is part of the joy and responsibility of owning them. It seems to me that you have mastered the Art of living. The elements of the laundry room that you have shared so far are fabulous, and I cannot wait until next week to see the rest. Seriously, that corner chair is STUNNING! And I love that you are using it in the laundry room. I can't wait for your reveal! So great, and organized ! THat paper is the best!! Just keeps getting better and better. Those supplies are like works of art and don't even get me started on that chair. Perfection. I want to move right in to your laundry room. Love your gorgeous laundry room. It's chic and functional, the beautiful cleaning supplies are definitely a plus! Still can't get over your stunning wallpaper! Tools that gorgeous deserve to be properly displayed. I clean my house too and rather enjoy it. Looking good! There is no greater feeling than cleaning your own home. Love the space!! Beth, I am dying over this. You are absolutely delightful! I so wish I had your talent! I just hate cleaning. I am jealous. It is looking so great! I have loads to do before I rest. Cannot wait to see the final reveals next week! So its the plastic tools that make me hate cleaning. Kidding. I really don't hate doing it, just wish I had more time to do it in!! Looking fab Beth!! It is so beautiful!! 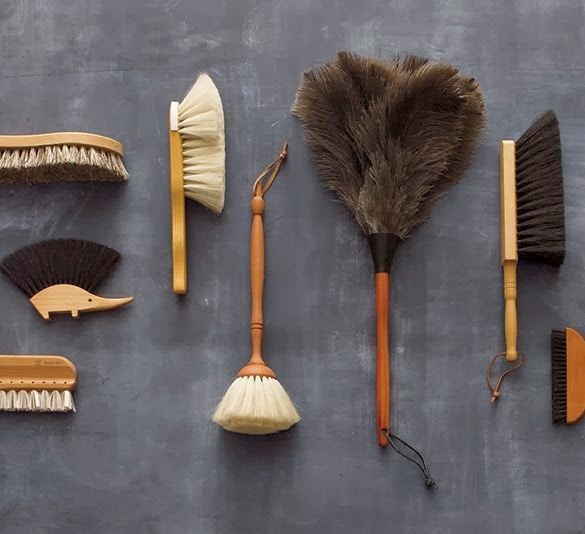 Never have I ever seen cleaning tools look sooo good. Wow! That chair! Gorgeous! 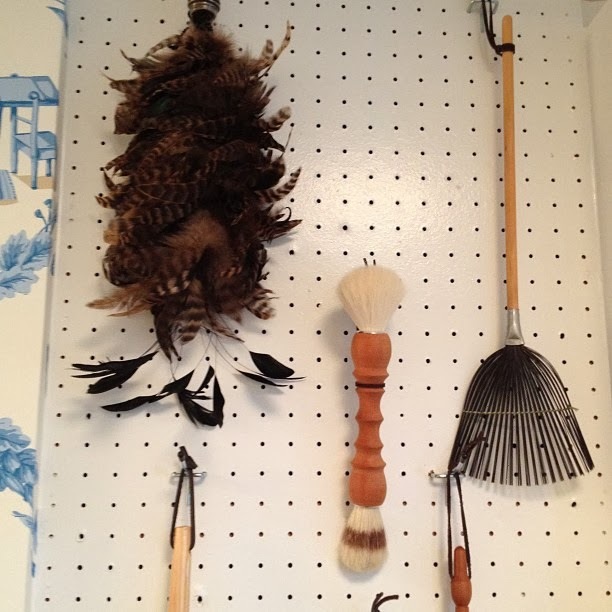 Yes, I agree that your cleaning tools definitely merit their display! Fab, fab! I know what you mean about it being like artwork. 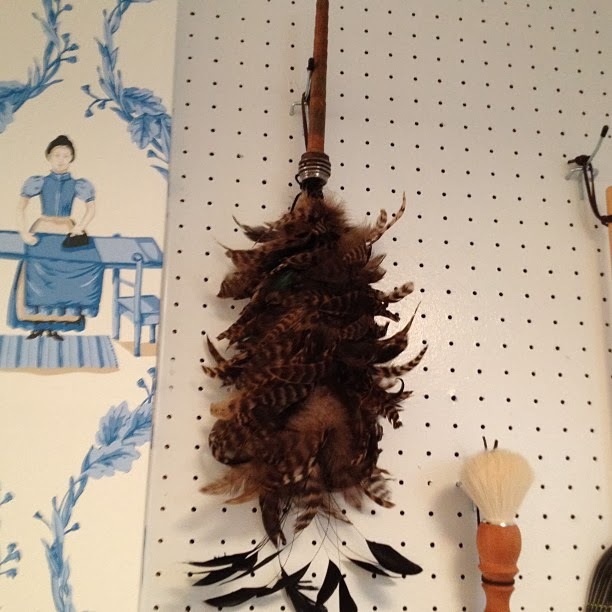 When I went to Vancouver last year, there was a store that made only brooms and they were the most beautiful brooms I've ever seen! 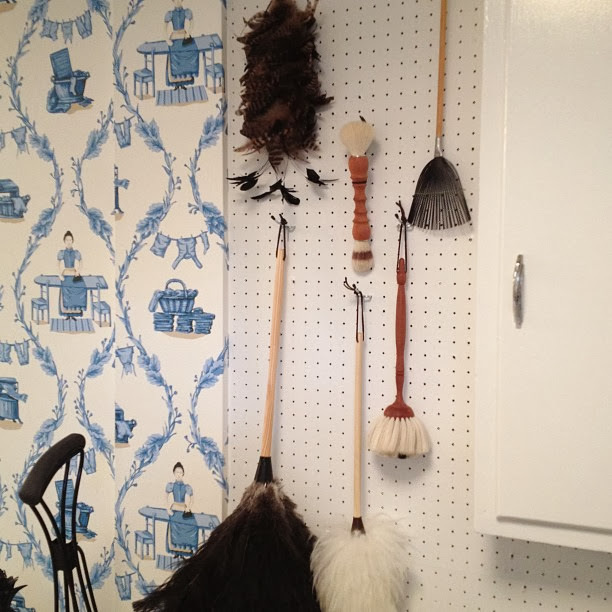 I don't love to clean, but I did love those brooms! ;) Things are looking great! How did I not notice the adorable detail in your wallpaper before? Perfect for the laundry room! 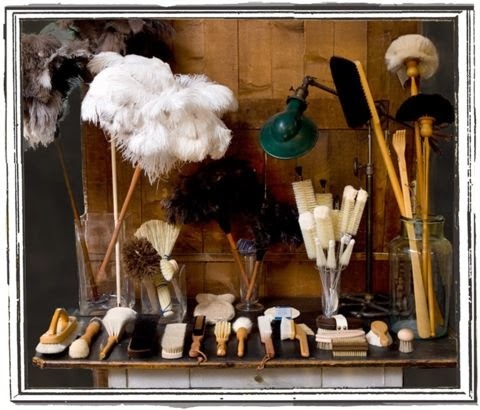 And, I love the chair and the fancy cleaning tools. I'm dying over the chair- so cute!!! As for the cleaning, more power to you sister. If I had that set up I maybe might like to do it too. Not only do I love doing laundry, I think ironing is the most relaxing and meditative activity on earth. I love your chair - it is perfection! Beth you are simply amazing. I love your collection of cleaning equipment in natural woods, fibers, etc! I am still on the floor --- I am impressed that you love to clean your house! the laundry room looks fab! You've really done Great so far-! 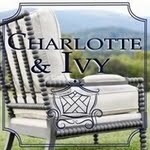 That Chair and the Upholstery - just Beautiful-! All the Blue & White - Charming-! Now you may just have to update the cupboard door hardware to something more Chinoiserie in style-! Can't wait to see it next week-! I could not agree with you more. I love to clean the house, ok not the bathrooms but the rest of the house. Love all of your brushes! That chair and seat are just fab, not to mention the rest of the room. 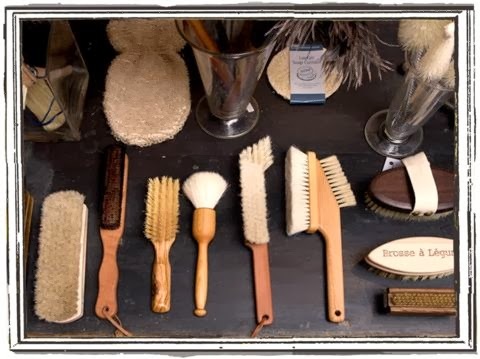 Love, love, love natural cleaning implements. Gorgeous. 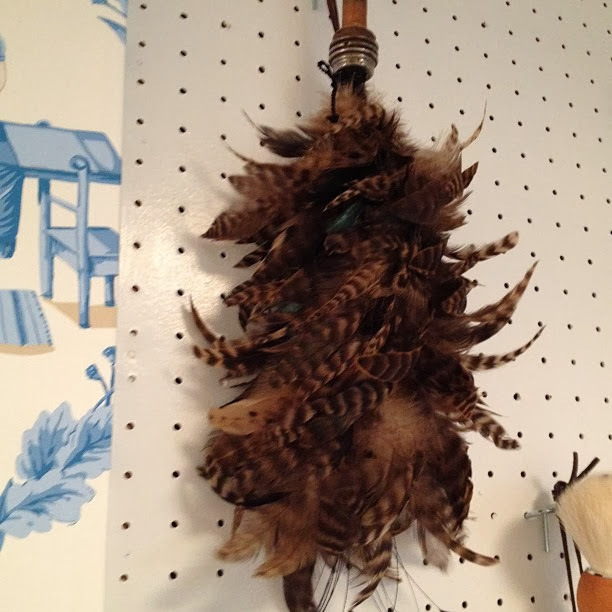 That feather duster on top is a work of art!